My daughter is a huge fan of Pinterest and often will send me photos of dishes she wants me to try. Since my family loves Quinoa (nutritional benefits) these Quinoa Burgers caught her eye and she begged me to make them. After reviewing the recipe I too thought they sounded great, and having most ingredients on hand I decided I’d make them for dinner last night. The recipe called for Red Quinoa, but the store I went to didn’t have those, so I decided I’d just use the White Quinoa that I had at home. Red Quinoa would have given the burgers on the bun a bit more contrast without changing the flavor, which I think would have looked more appealing. In my classes and on my blog I always say “read the recipe from beginning to end at least 2 times before preparing a recipe.” I did this, but my eyes apparently scanned over one word, “cooked” as in “cooked Quinoa.” We all make mistakes and even though these turned out great I’ll be adding more beans (black beans this time) to the remaining Quinoa. The first way means to sift the flour then measure it. While #2 means to measure 2 cups of flour, then sift it. I overlooked the directions for this recipe which stated, “2 cups cooked Red Quinoa.” Instead I cooked 2 cups of raw Quinoa which then doubles when cooked. I’m telling you this because mistakes like this can make a HUGE difference in your recipe. Fortunately it didn’t really affect these burgers by much, but the proportions were a bit off. With the remaining Quinoa I’m going to add black beans to add more bean flavor. Also, next time I would add less chipotle chile powder – I think it would be too strong with the proper Quinoa proportions. However, that’s my taste, yours may be different. I had never made a Quinoa burger before, but since we all love this Quinoa recipe, I think I’ll make it next time, omit the tomatoes, and use large slices as a garnish. I will still add the cheese, Panko and egg (from the recipe below) which help to bind it together. Overall I liked the process of the recipe below and flavor from Half Baked Harvest. I did include my recipe for Sweet Potato Fries which Half Baked Harvest places on top of her burger. We ended up eating ours on the side. If you like Quinoa, and burgers, use this recipe as a guide to create your own Quinoa burgers. They’re healthy and filling. In a bowl combine the quinoa, mashed cannellini beans, bread crumbs, egg, garlic, chipotle chile powder, salt and pepper. Mix well to moisten the ingredients and then mix in the shredded cheese. Mix well again and form into 4 or 5 equal burger patties . Place on a plate and put in the fridge. Line a sheet pan with heavy duty foil and coat with non-stick spray. Place cut potatoes on pan, drizzled with Lawry's Seasoned Salt. Bake for 20-30 minutes or until golden brown. You want the sweet potatoes to be crispy, but not burnt. While the fries cook, caramelize the onions. Heat large skillet. Add 1 tablespoon olive oil over medium-high heat. Add onions and cook about 15 minutes, stirring frequently, until softened. At this point you want to slowly add the beer, let it cook into the onions, add more and let it cook. Do this until entire cup of beer is gone or the onions are caramelized and beer has evaporated. Remove from the skillet and keep warm. In the same skillet add 1 tablespoon olive oil. Add the quinoa burgers and cook until golden and crisp, about five minutes per side. During the last minute or so of cooking add the cheddar cheese, cover the pan and cook 2-3 minutes or until the cheese has melted. To assemble the burgers, place each burger on a bun, top with equal amounts of caramelized onions and sweet potato fries. I’ve never had a quinoa burger. Sounds like a fun idea. Really good suggestion to be careful about reading recipes – it’s so easy to misread. I know I’ve done it! Good stuff – thanks. Love patties made with quinoa, Vicki. Your burger looks to die for! 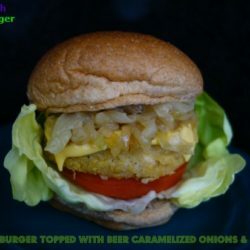 Yum, what a great idea making quinoa patties…I love the ingredients in the burger…indeed very healthy. Love the recipe for the quinoa patties and the onions and the sweet potato and shall try soonest, BUT without any bun ~ the common practice of serving both on the plate has always flabbergasted me: I very much approve of the usage of healthy carbohydrates, but why a double portion already for health reasons 🙂 ? Glad you caught the mistake before you added 4 cups of cooked quinoa to the burger. I’ve never had a quinoa burger and I sure love the flavors in this one. Between the beans and quinoa this is definitely a nutritional burger! Thanks for sharing Vicki! It’s true. It’s easily misunderstood when we are in the kitchen already trying to cook. I try to write recipes like 2 cups quinoa (before cooking) in most of my recipes, especially if other ingredients are raw and need everything to be cooked. 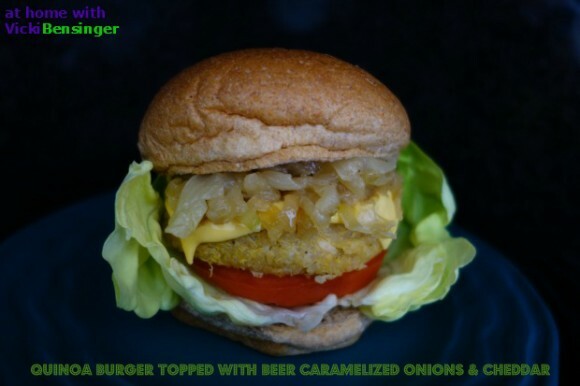 Never had quinoa burger – how creative! And it sounds yummy! These would be wonderful to try for a meatless meal. The red quinoa would make the burgers look more like a real burger too. I don’t think I’ve seen the red quinoa – will take a look next time I shop. These sound so good to me…I think if I didn’t enjoy a good beef burger from time to time, I could definitely be a Vegetarian. Perfect for a meatless meal, which we’re trying to have more often. I have a big bag of quinoa too…serendipity!